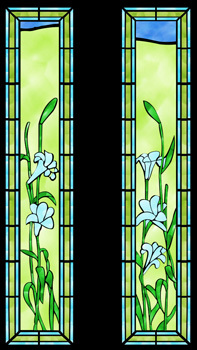 Swimming pool rooms and enclosures can benefit from beautiful stained glass panels. If you want a pool enclosure that is both beautiful and functional, then look no further than Stained Glass Inc. Our talented team of artisans can create a custom pool room, just for you, that is constructed entirely of stained glass. Stained glass pool rooms are unique and dramatic and look beautiful both inside and out. Stained glass natatoriums allow you to take advantage of natural light without sacrificing aesthetic appeal or your personal privacy. The translucent quality of beautiful stained glass gently filters the sun while blocking unwanted glares and other unattractive views. Additionally, our designs are made from shatter-resistant polymer glass, allowing them to repel and protect against outside elements. If you are looking for a more subtle way to incorporate stained glass in your pool room, consider utilizing Stained Glass Inc.'s window inserts. These custom inserts will offer a splash of color and a touch of elegance to any room. Inserts can be customized to fit any size, shape, or design you desire. Start designing yours today by talking with one of our design specialists. Exquisite stained glass is only a phone call away. Contact Stained Glass Inc. to begin your journey today.